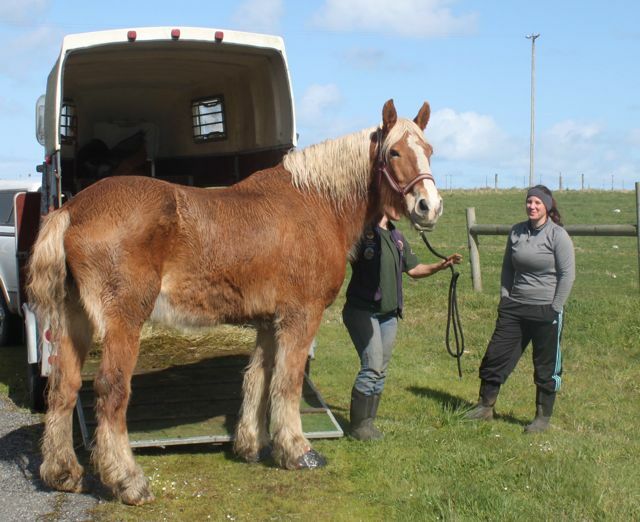 In Part One of this blog post, I introduced you to a sweet Belgian mare with hoof problems as big as her. 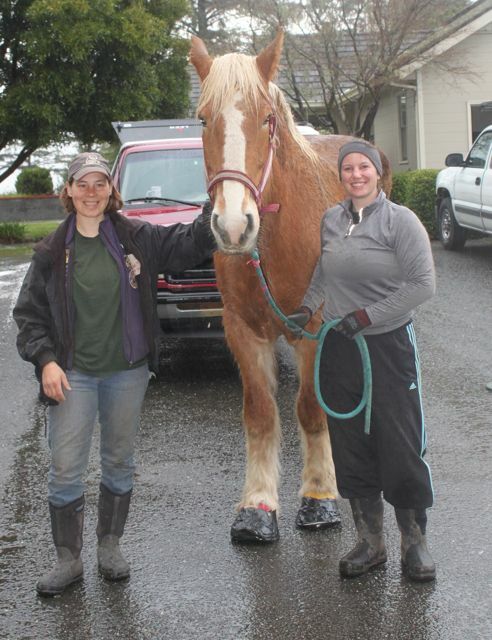 Megan Hensley of Holistic Hooves and I, are working together to hopefully help her grow some new hooves on Sparrow’s Cheval, aka Chevy. 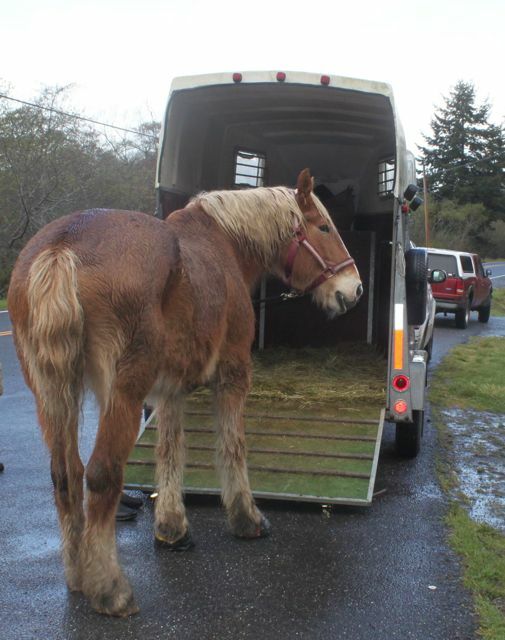 Here is the continuation, her trim, and her journey to Megan’s place, where she will be rehabbed. 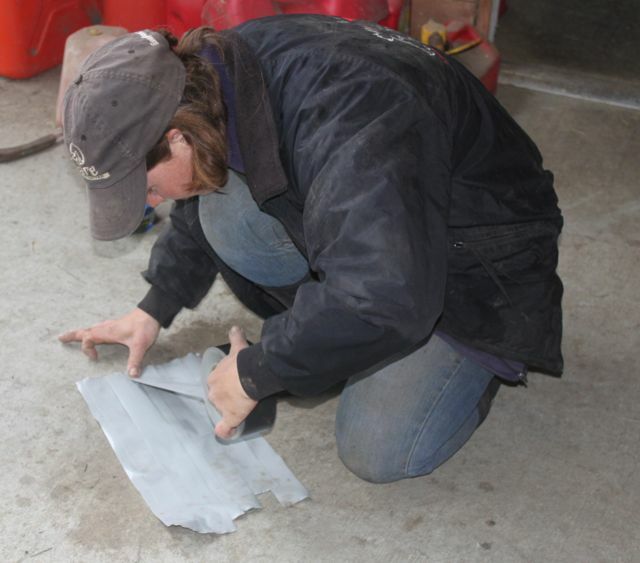 Looking at the separated lamellar wedge and figuring how far back we can go on this trim. 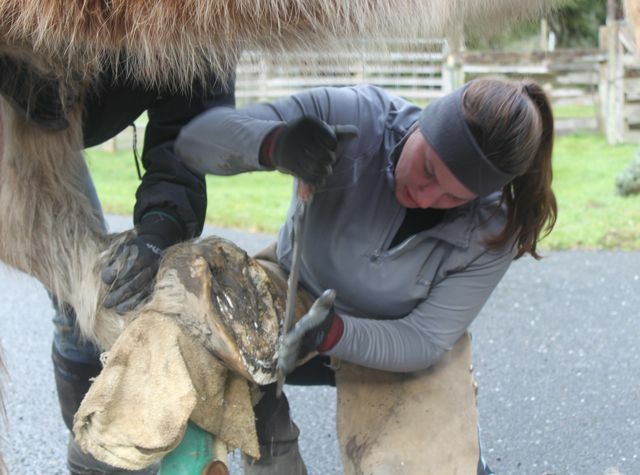 Megan starts to tackle the first hoof. Lots to cut through and a bit of work. Rasping off the worst of the sharp edges and then taking some more from the outside. 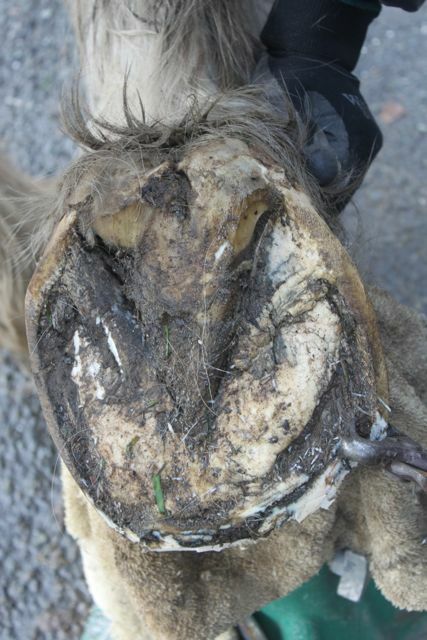 There is actually a normal hoof shape under all this I think. 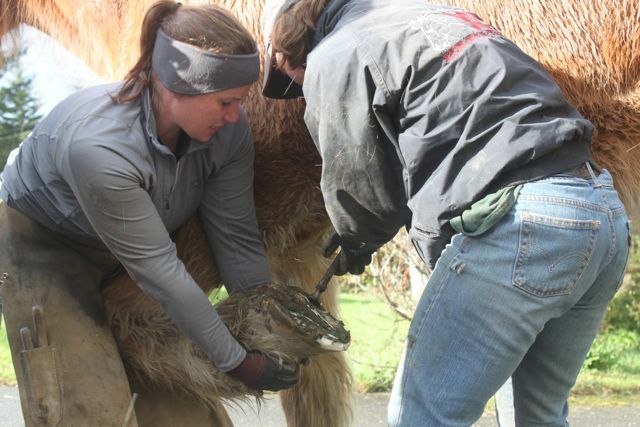 It will take managing the hoof until the new one grows back out. More rasping, and then from the top. She was not wanting to stand it on a stand, so we did it on the ground. 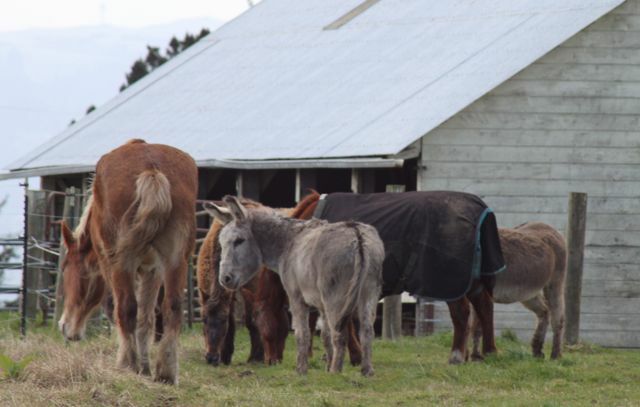 Meanwhile, I check the other hoof and see what we have there. Good enough for today. 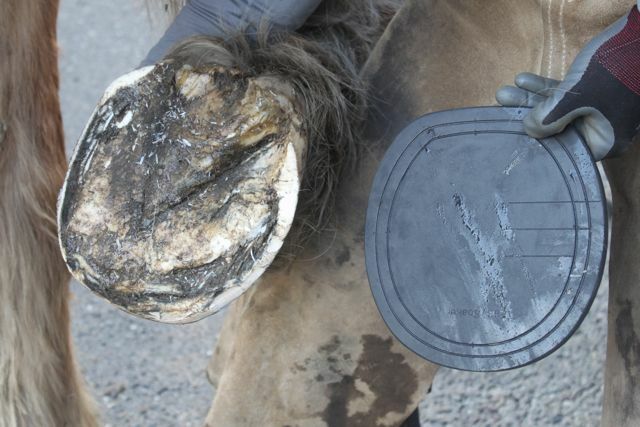 Poor hoof is still pretty misshapen, but the worst of the wedge is off. 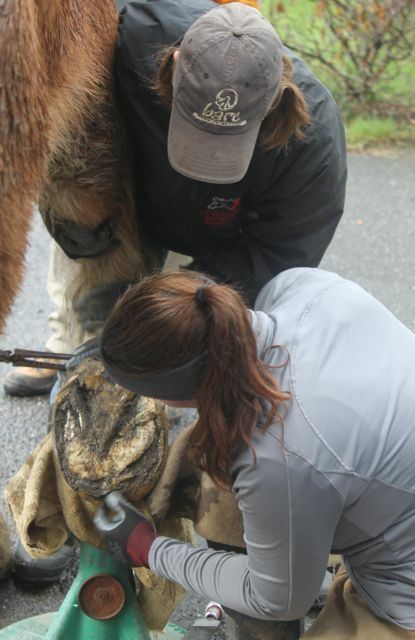 We wanted to leave some, as she has no other protection for her hoof and her heel is more under her. Next, we made some padded boots for her. 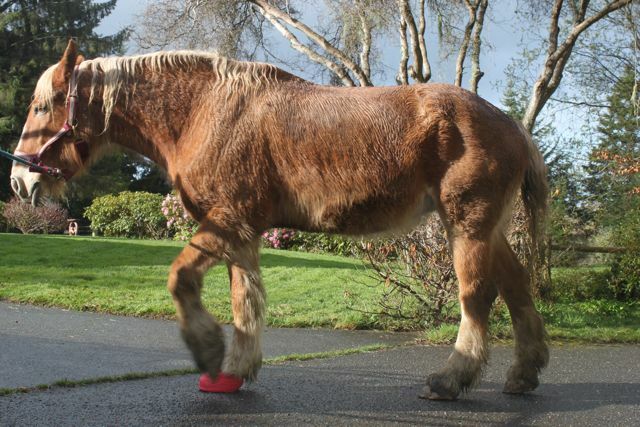 We didn’t have any draft sized Easyboots in stock, and it turns out, that even the largest Easyboot, Epic or Boa are still too small for her deformed foot, let alone an RX boot. We used Gorilla tape, an Easycare Comfort Pad (even the largest one of that barely fit), and vet wrap. This lasted a few days, but then was sucked off in the mud. 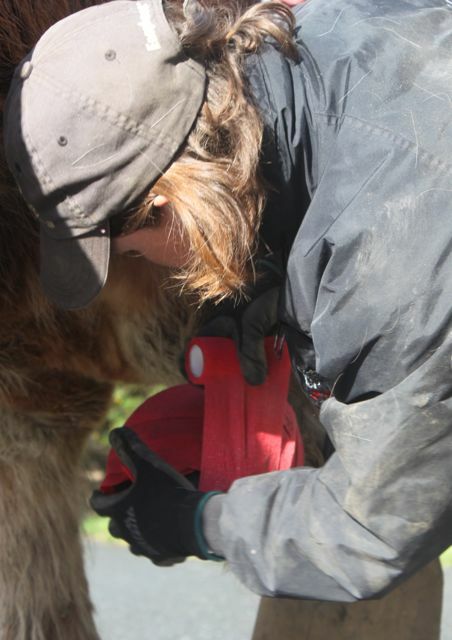 We cut a sole relief area into her pad, as the dropped soles didn’t like the pressure of the pad, or just standing on the foot without any relief. 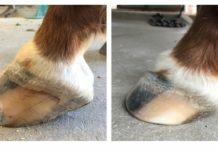 The finished hoof and pad, and the pad fit. We missed getting a picture of the sole relief. But basically we cut a semi-circular shape, that had its arc near the tip of the frog, and went just forward of where the thumb on the right of the right side picture is, on both sides.We walked her both without and with the relief, and she walked out much better with the support. 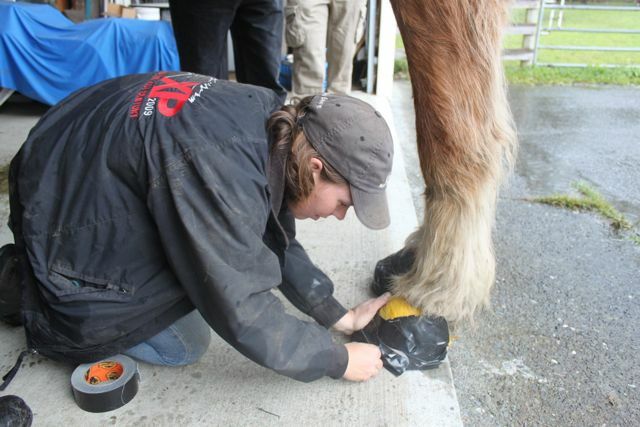 Next a layer of vet wrap all around, to secure the pad and protect the hair from the tape. here we still had the full pad, then after walking we tried the sole-relief. 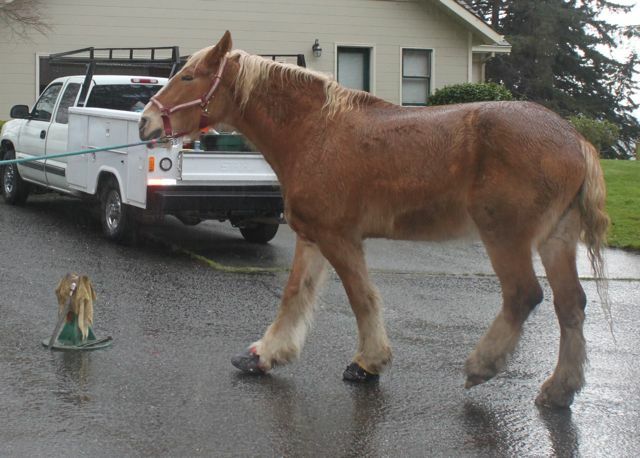 Chevy is walking alright on the padded hoof. 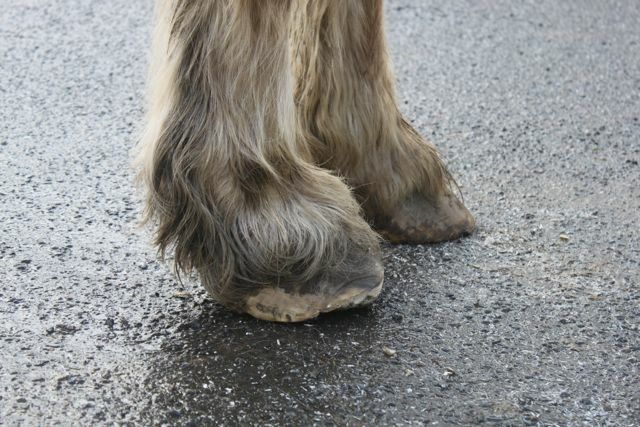 Looking good, so now on to the other hoof, then we finish the ‘boots’ for her. 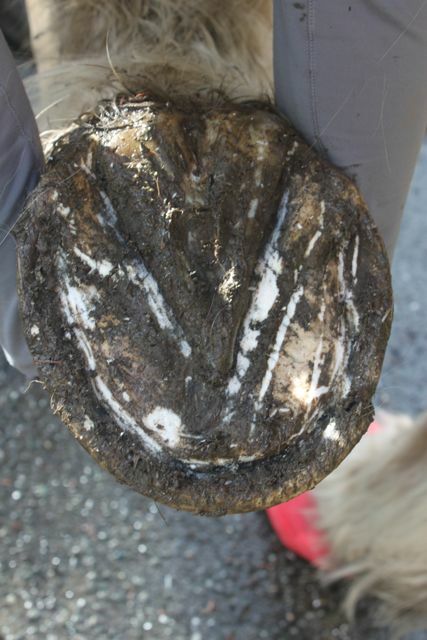 This hoof actually looks normal, just needs to be trimmed up. 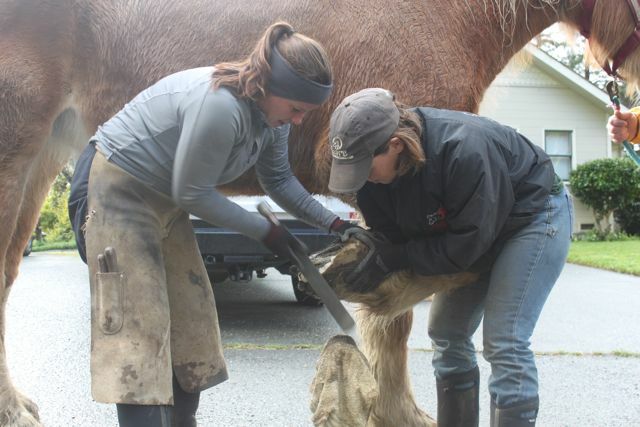 I tackle this hoof while Megan holds the leg. 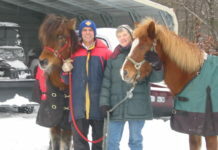 We find that having two people, one leg holder, one trimmer, and switching off as needed, sure makes it a lot easier to work on draft horses. 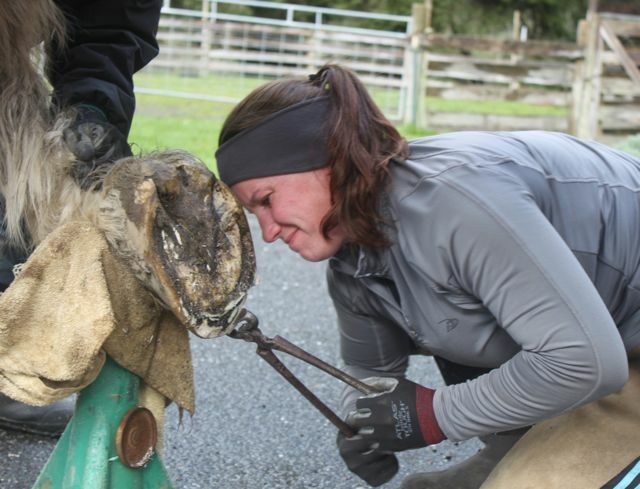 This is particularly true if they are unable to hold their leg up due to pain issues like Chevy, or unwilling or untrained to stand and leave hooves in a cradle or stand. 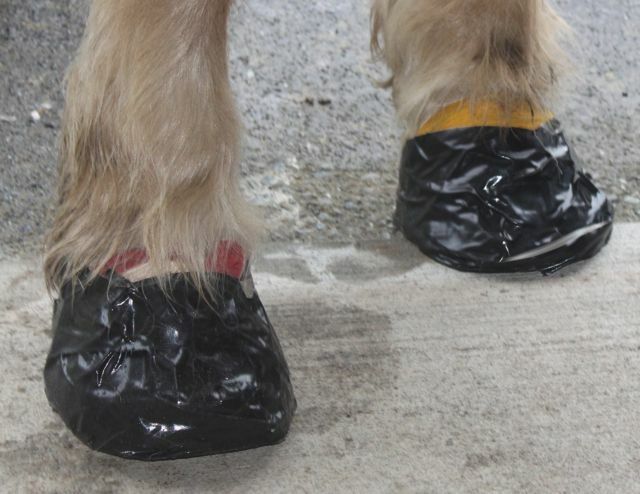 I start my boot with a ‘pad’ of double layer tape, that will go on the bottom of the hoof and up the sides a little. 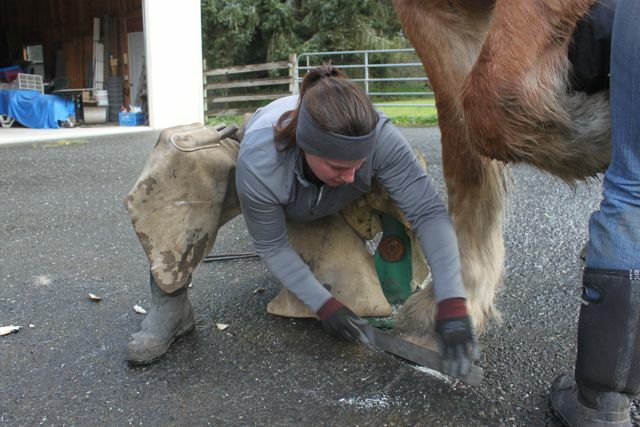 Then I tape down strips on the wall, all around the hoof. 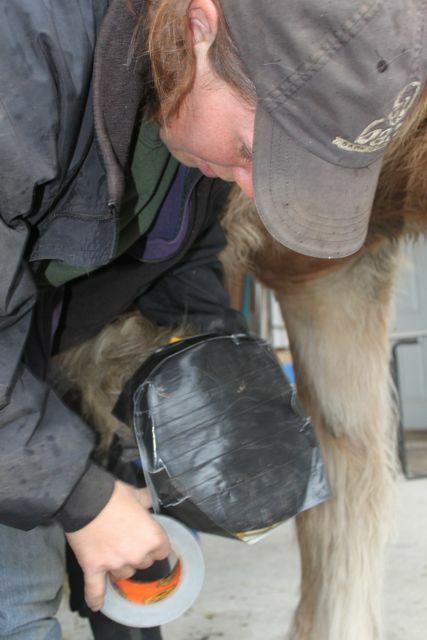 Then I wrap a continuous strip around the hoof from the bottom edge up to the top. This is a fairly effective boot and will hold a few days in wet weather, or a week or more in dry weather. 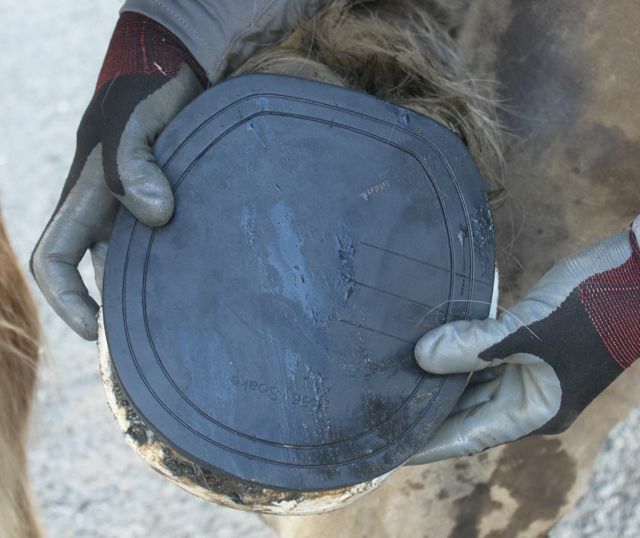 You can always make a thicker bottom pad if it wears down. A nice, ‘custom’ boot. But the problem? 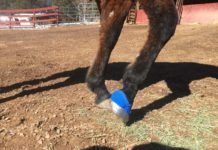 It takes a bunch of vetwrap and tape and thus, money when changing this every few days or once a week for months of rehab you soon far exceed the cost of hoofboots). It is also not breathable, so you get thrush, seedy toes, and other issues, which are already a problem with these compromised feet. 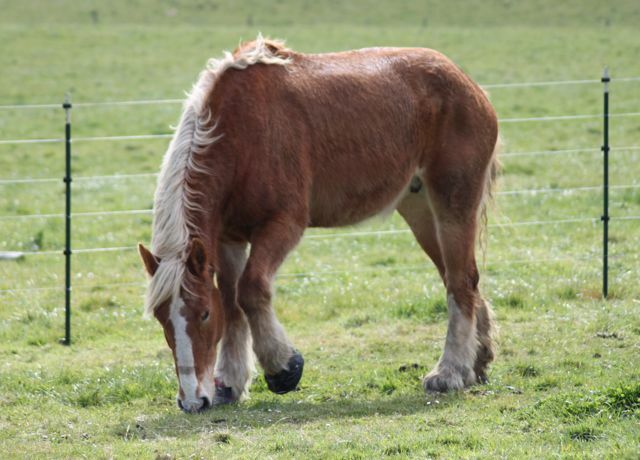 If you are working on an animal that is not very sore, and is very exuberant, the boots will wear through and fall off fast. 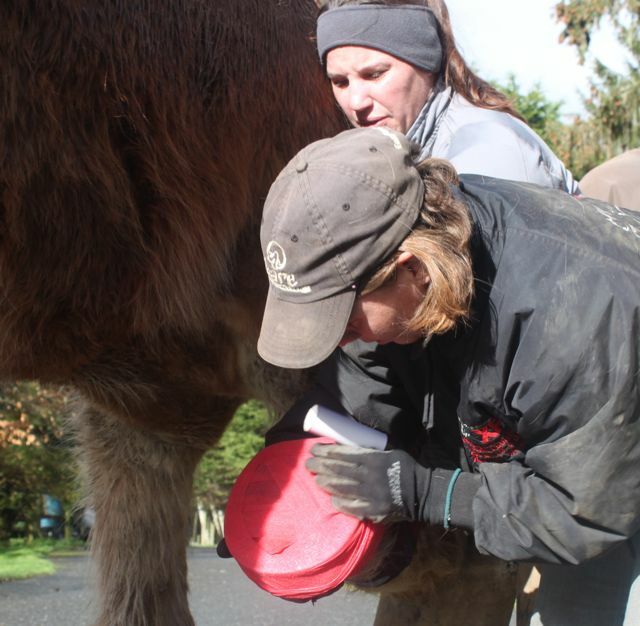 But as an emergency measure, this is a tried and true method for abscesses, laminitis, navicular, or anything else you would have used a boot and padding system for in pasture. Chevy is still not super happy (will be many months before that foot is better), but she is landing heel first and can walk! So we are pleased. Chevy and her Hensley and Herman Draft Services Team. 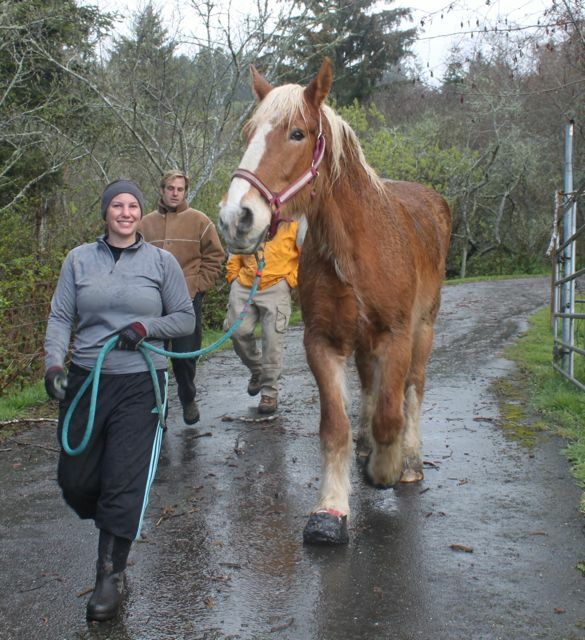 Megan leads her down the drive and to the trailer. 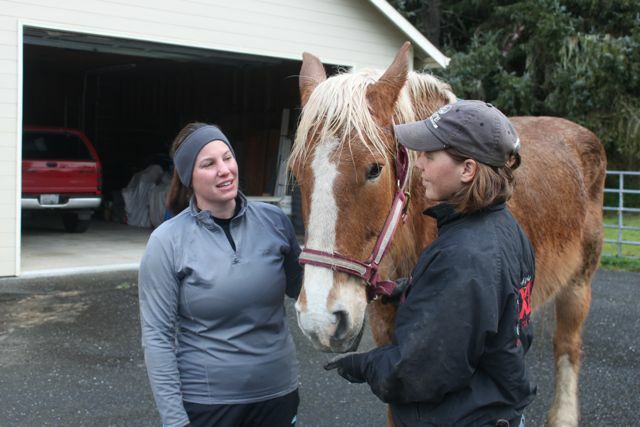 Her next adventure awaits at Megan’s equine rehabilitation ranch. Will I fit? Yes. Most every horse does. I simply adore my Brenderup (center divider removed for her sake, usually it hauls two). I often wonder why here in the US we don’t build light trailers like in Europe. 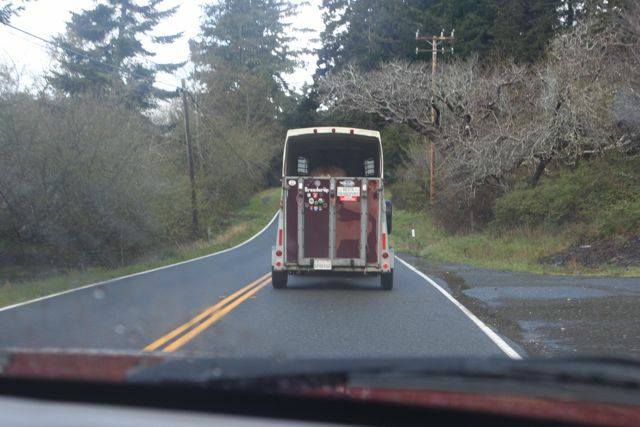 With fuel prices skyrocketing, these little trailers can be pulled by a smaller pickup, an SUV, or a larger sedan even. The fit in even the smallest forest service camp grounds and are easy to maintain, since they are made of synthetic materials. This trailer is a 1980’s model and is still going strong, even in wet and salty coastal conditions. Fun! 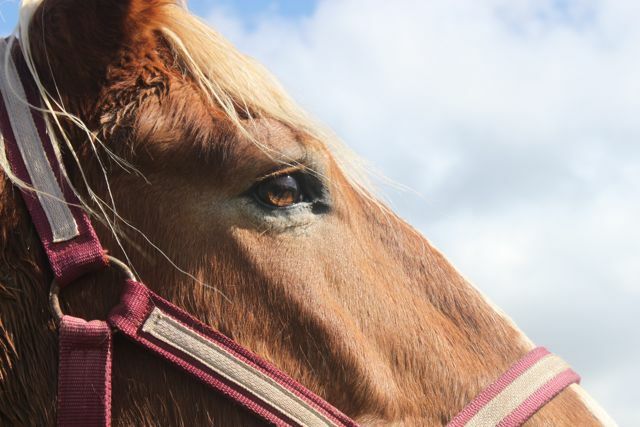 Usually all you can see is the tips of my horse’s ears (14-14’2 size). 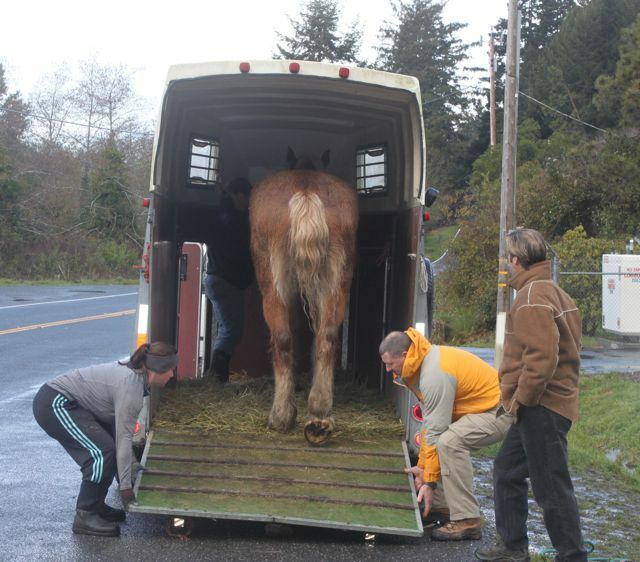 Chevy looks like a normal sized horse in here, LOL. 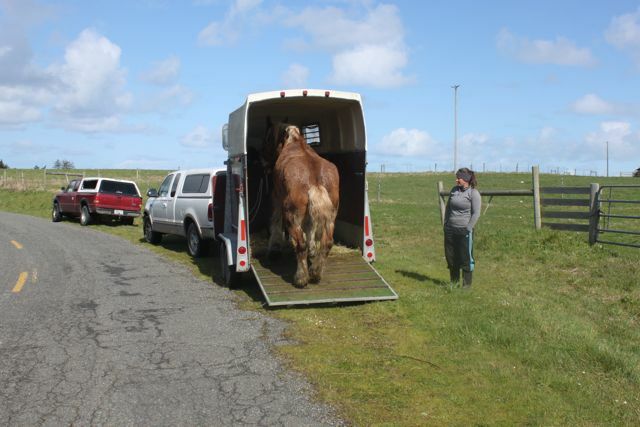 She rode fairly well and then walked out of the trailer quietly as well. 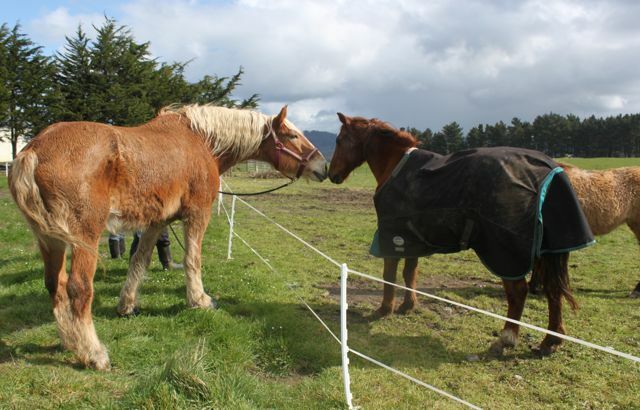 An introduction over the fence. And she is in the herd with no problems. 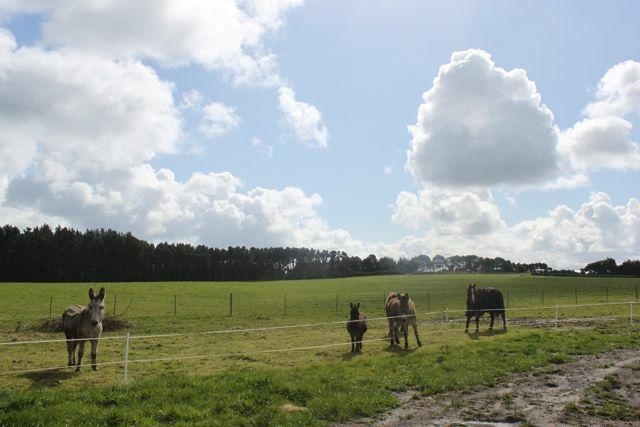 She is moving around the pasture just fine in her boots. Here is hoping for a successful healing. 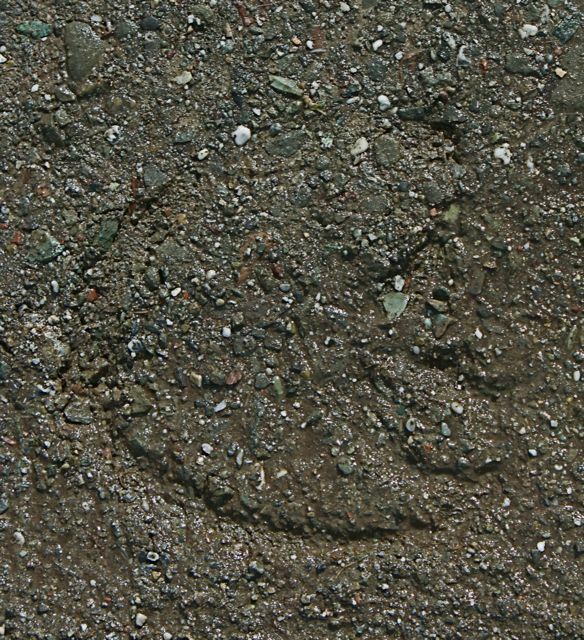 This was a print one of her back hooves left in the driveway. One day, all of her feet will leave healthy looking prints like this.